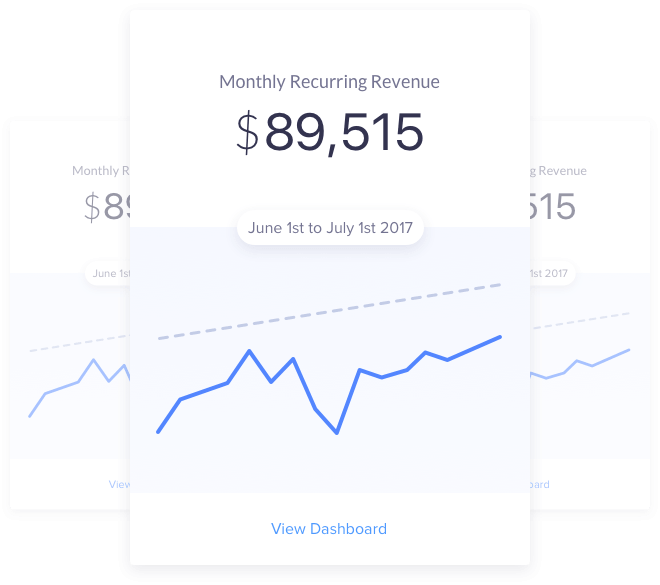 Monthly Recurring Revenue, commonly abbreviated as “MRR” is all of your recurring revenue normalized into a monthly amount. It’s a metric usually used among subscription and SaaS companies. 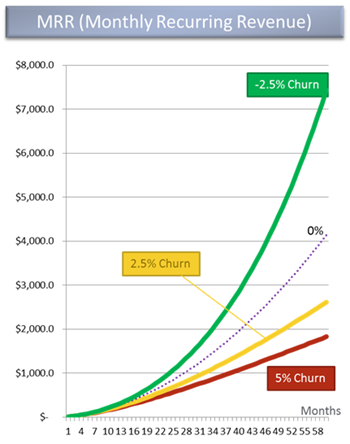 Recurring revenue is the lifeblood of any SaaS. It’s what makes building a SaaS so appealing. You don’t have to worry about one-off sales that may or may not return. If you’ve got a solid product, they automatically return. Every. Single. Month. Amazing. In general, it’s a straight forward metric, but there are some nuances that you’ll want to take in to consideration depending on your business model. 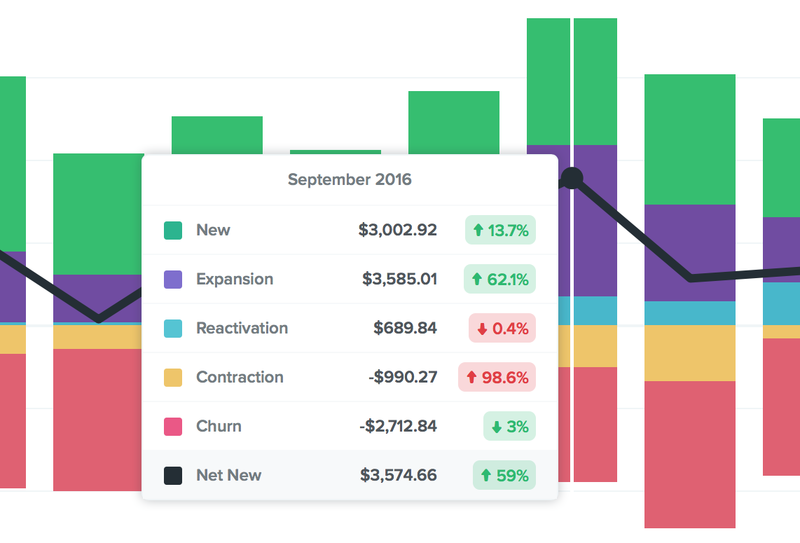 MRR is all of your recurring revenue normalized in to a monthly amount. It’s a way to average your various pricing plans and billing periods in to a single, consistent number that you can track the trend of over time. Calculating monthly recurring revenue on a high level is straight forward. So 10 customers paying you an average of $100 per month would mean an MRR of $1,000. How do you calculate how much new monthly recurring revenue you’ve got? As your business grows, it will become important to track not only your top-level MRR but also what factors make up the change in your MRR over previous months. If you added $1,000 in new MRR, you’d want to know where that came from, right? Lucky for you, that also is relatively easy using 3 elements that make up what we’ll call “Net New MRR“. If you churn more MRR than you get from New or Expansion MRR, you end up losing MRR that month…which would make you sad. Very, very sad. As wonderful as recurring revenue is, it can also be the most downright frustrating and eye gouging part of your business. Gail Goodman, CEO of Constant Contact calls this the “long, slow, SaaS ramp of death”, and for good reason. You can put in months of hard work improving every last nook, pixel and cranny or put together the greatest marketing campaign your team can muster, all to barely budge your MRR graph. Heck in some cases you may actually see a decline in your recurring revenue. So while there are certainly stories you’ll read on Hacker News or Reddit or Twitter about someone with “hockey stick” growth, the fact is…99% of businesses won’t see that. Instead what they’ll see is slow, painfully incremental, boring growth. But! It’s not all doom ’n gloom! There are in fact things you can do to increase it. Things you can start putting in to practice today! Let’s take a look at four things you can get the ball rolling on now to start getting more revenue! I know, I know. Charging more sounds obvious, but the fact is, most companies are drastically underpricing their product. The most common cause of charging too little is that we, as founders, are self-conscious. We’re afraid of rejection and we don’t give ourselves enough credit for the problems our companies solve. The fact is, if you’re solving any real, tangible problems for your customers, you shouldn’t be charging single-digit amounts. Every time I see some business software charging $5 a month I want to scream at them. It’s insanity. Businesses use software for at least one of three things: to save time, to save money or to make more money. These are all summed up as “value”…businesses pay for “value”. If your product is only creating $5 of value, then I’d suggest that maybe you should find a new product. That’s harsh, but I’d also suggest that chances are your product does create a lot more than $5 of value. Let’s do some quick math here as a simple example. How much is your customer’s time worth? I’d bet at least $50/hour. Depending on their role, probably hundreds of even thousands of dollars an hour, but let’s start on the low end. If you save them over 6 minutes of time a month, then you’re already underpriced at $5/mo. But I bet you aim to have people spend more than 6 minutes of time a month with your software. There’s just no scenario where you shouldn’t be charging at least $20 a month for your product. And in reality most companies will happily pay many multiples of that. But if you’re weary of this, then just run a little test. Double prices. Just double them. Don’t change anything else. Don’t rearrange features or raise limits on anything. Just double the prices on your pricing page. And wait. Then, in a month, check if your conversion rates or growth rates declined. My guess is that neither will decline…in fact I’d bet both will actually increase! Now, do it again. And again. And again. Do it every month until you find it’s not having a positive effect on your revenue growth! Who are you more likely to trust with your business? Someone you’ve had zero experience or interaction with? Or someone you converse and interact with on a daily basis? And that’s why it’s much cheaper to grow revenue from your existing customer base than by acquiring new customers. It’s not that you don’t need both, but acquiring new customers is just always more expensive. If the customers you’re serving are growing and getting more value from your business over time, then you should match that with pricing. You aren’t running a charity, you’re running a business and if customers are getting more value, then that’s the perfect opportunity for you to offer an upgrade. The value you provide should always be greater than the price they’re paying, but they should grow somewhat in parallel. There are all sorts of ways, logistically, to set this up. You can get really creative with this stuff, but let’s talk about a few common ones. Per-user or per-seat pricing is one common way to attach value provided to value received. This type of pricing essentially means there’s no limit to how much you could make from a given business. As your customer grows and more of their team uses your product, the more you make. Atlassian — They’ve got a whole suite of various products, but pricing is all based on the number of users. Slack — Pricing starts at around $6/mo per user and goes up from there based on the features needed. You’re probably most familiar with metered or usage-based pricing from hosting/infrastructure companies like Heroku or Amazon Web Services. The more you use their services, the more you pay. There’s a very literal correlation to the exchange of value. You likely have some base plans that you already offer, but deciding ahead of time exactly how you “bucket” features within those plans can be a little bit of a shot in the dark that you aren’t ever sure you have right. If you position your biggest features as “add-ons” it’s easy for your customers to essentially create the perfect package of tools. It’s also a much easier upsell (i.e. “For just $10 more per month you can get Feature X”). Freemium is something that’s a default for nearly any software company. Seems silly to even suggest not having a free plan. But that’s exactly what I’m suggesting. Get rid of your free plan, you’re giving away the farm. I know, I know. It’s not that easy. So lets break it down a bit. What’s the purpose of a free plan at all? Well, generally it’s used for one of two things. The thinking goes that by having something that’s free, you can get exponentially more people in the door, giving you the opportunity to then sell them on a premium plan. It sets your user base up to categorically not value your product. Arguably “free” as a marketing tool can be great for consumer businesses, as consumers are traditionally extremely price conscious and have a near infinite number of options. Their motivations for spending money are usually much different as well (most things consumers by are “wants” not “needs”). But there are very few business scenarios where a blatantly “free” plan is beneficial. The economies of scale just don’t work in your favor. You need a huge “top of the funnel” to make the conversion rates pan out profitably in the long term. On top of that, it’s very expensive to support all of those free users. Large, venture-backed companies with 10’s or 100’s of millions in the bank can afford to support a large free user base. You cannot. Many companies use a “free” plan as a way to let potential customers try out the software. They get the benefits of the “marketing tool” angle plus users get to see what type of value they could get! Two birds, one stone, right?!?! Wrong. Not only do you have the downsides of the “free as a marketing tool” angle, but you’re also offering your customer a limited view of what you can do for them. That means the message that gets sent to the customer is “this has very little value and also can’t even do that much for me”. So what’s the solution here? Instead of offering a free plan, offer a time-limited free trial. 7 days, 14 days, 30 days, 60 days…doesn’t really matter how long other than they need enough time to be able to understand just how much value they’ll get from your service. But there is one bit of advice that I strongly urge you to consider: never offer an “unlimited” plan. Early on in my career I made this mistake. I had never built a business on recurring revenue before, so coming up with a good pricing model was the same as pulling numbers out of thin air. After coming up with what, I thought, was a great set of plans, I decided I’d shoot for the proverbial stars and throw out an “unlimited” plan for a whopping $99. Ha! When you’re brand new to pricing, it’s easy to think “If I can get anyone to pay me $99 a month, I’ll be set!” You’re itching to make some money, any money, and you’ll give away the farm to try to entice people to fork it over. But stop. Stop giving it away. Chances are you’re already charging far too little, and having an “unlimited” plan just puts the nail in the coffin. Here’s why. As we talked before, when you’re pricing anything, you should be pricing based on value. You need to find a balance of where what they’re paying is comparable to the value you’re providing, and the more value you provide, the more money you should make. With that in mind, does “unlimited” makes sense? No. Because they get “unlimited” value while you just capped how much revenue you can make on any given customer. Now would be an appropriate time to facepalm. Do you realize how bad of a move that is? The type of customers who will make use of that “unlimited” plan are exactly the customers who will be more than happy to pay you exponentially more than you’re charging! They’re the ones who stand to get the most value and the more they use your product, the more value they get! Charge them accordingly. While on the surface MRR is a very straightforward metric, it’s actually very nuanced and can give you a crucial picture of how your business is growing (or not). But how do you get to that nuanced data? What should you look for? What points to potential trouble? And how do you grow MRR so you can in turn grow your startup? Let’s take a look! Many of these tips make use of features built directly in to Baremetrics , easily surfacing the insights covered here. But the data points themselves are likely accessible to you no matter what software you use…it just may take quite a bit more digging. The reason knowing those types is important is that it gives you direct insight in to the “why”. You get to see exactly why your MRR went up or down in a given month. Seeing the “why” in chart form is very helpful. There’s a lot of information here, but if we zoom in on a single bar it’s a lot easier to understand it. We had New MRR (new customers) of $3,002, which was a 13% increase over the previous month. We had Expansion MRR (upgrades) of $3,585, which was a 62% increase over the previous month. We had Reactivations MRR (previous customers who came back) of $689, which was a slight decrease over the previous month. We had Contraction MRR (downgrades) of $990, which was nearly a 100% increase over the previous month (ouch). We had Churned MRR (cancellations) of $2,712, was was down 3% compared to the previous month. Adding all of these MRR types together resulted in a net increase of MRR to the tune of $3,574. Now, the observations we can make! Expansion MRR almost outpaced churn + contraction MRR…we were so close to negative churn this month (more on negative churn below). But this is big because it means even if we hadn’t added new customers, we’d still have grown just from our existing customer base. Had we not broken down this MRR by type, all we’d see is “Yay! $3,500 in growth! #winning #blessed “. We’d miss out on the fact that we churned over $2,700 in revenue…which is something that needs to be worked on. If we zoom out a look at the whole chart, you’ll see the black line (for Net New MRR). That line is a sort of “growth velocity” line. If it stays perfectly flat, you’re basically growing by the same dollar amount every month. That, in turn, actually means your growth percentage is declining. As much as possible, you want that black line to be angled upwards as that means you’re increasing your growth rate. The Net New line can be pretty erratic, but as the line becomes more stable, you’ll find your business as a whole becomes more stable. It means your growth and revenue are much more predictable. If you aren’t breaking out your MRR by type, you’re really missing out on some crucial data points. There are so many knobs to twiddle when building a business and the more you actually know what each knob is doing, the more efficient you’ll be. 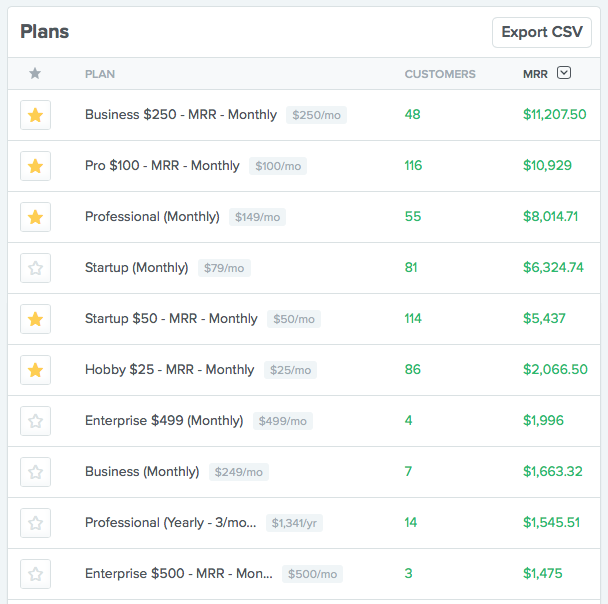 Knowing what percentage of your total MRR your plans make up is very important. For example, what if you have 90% of your customers on a plan that only makes up 10% of your MRR? That’s balance you really shouldn’t force to work because the support load wouldn’t cover itself. A table is great for visualizing this. These are our top 10 plans, based on MRR. From this we can make a couple of interesting observations. On the other side of the equation, 18% of our customer base is paying ~$25/mo while only contributing to 5% of our MRR. This realization actually led us to discontinuing the $25/mo plan due to this imbalance. The economics of supporting that much of our customer base for a very small percentage of MRR just don’t add up. Know where your revenue is coming from and focus your efforts on the plans that have a higher yield. Looking at large quantities of data can sometimes be misleading. Seeing a big drop on a single day can sound alarms in your head, but the important thing is not one-off events. What really deserves your attention are the trends over time. Reacting to singular events is a recipe for disaster as there are an infinite number of anomalies that can occur that you can ignore. I find looking at data on a level an more granular than monthly is mostly futile. You definitely want to be careful when making major decisions on granular data. Monthly is about as small as you want to go when using the data for company-direction type of decisions. Using trend lines is a great way to tame some of the anomalies and get a better understanding of the averages and the general direction things are heading versus getting distracted by blips on the radar. Here’s a Moving Average trend line that smooths out the hills and valleys from a few months of data. There are a number of different types of trend lines built right in to Baremetrics. Linear — Linear draws a straight line through your data and completely ignores peaks and valleys. If you’re looking at a metric that is mostly up-and-to-the-right (such as MRR, hopefully) Linear is a great choice. Logarithmic — Similar to linear except it will follow a curve. Great for data that changes rapidly and then settles, like say a rapidly growing MRR that plateaus or slows. Polynomial — Another one with lots of syllables! This trendline is great for following data with lots of peaks and valleys. Polynomial trendlines may have a maximum of 2 curves. Churn and LTV are two metrics that Polynomial trendlines can work well with. Power — These trendlines change at a specific rate. This works well with any up-and-to-the-right type data, like say MRR. Exponential — This is for data that rises or falls at an exponential rate. Only a handful of businesses grow at an exponential rate–a great example is a company like Slack. Moving Average — For each data point, we look at it, and the two other data points next to it, and average them. This is great for data that ebbs and flows quite regularly, and often has erratic data points. Churn, LTV and ARPU often work great with this method. The term “negative churn” has become a bit of a buzzword in the past couple of years and has been called everything from “the holy grail” to “the spawn of satan”, but drama aside, it’s just a tool. So, what is negative churn? Negative churn is when Expansion MRR (upgrades) outpaces Contraction MRR (downgrades) + Churned MRR (cancellations). It’s when you’re able to grow revenue without actually adding new customers. It’s essentially a big growth multiplier. As this graph from David Skok’s original post on the topic back in 2012 highlights, focusing on expansion MRR is a really powerful way to grow your revenue. Metrics, in and of themselves, aren’t all that useful. They’re just numbers. A given number on a given day holds little value. How a given number changes over time is where real value and insight usually lies. Don’t get caught up in the day-to-day blips. Instead, focus on historical trends so you can make future predictions.